SportDOG Locator Beacon Dog Safety and Location Light. $14.95. 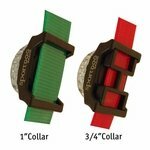 The SportDOG Beacon only slides onto E-collar straps. It will NOT fit a standard dog collar unless you use the included carabiner clip. Also note that the 3/4" collar strap adapter comes pre-installed. If you want to use it on a 1" collar strap, just remove the adapter by popping it out of the base. Today we are looking at the SportDOG locator beacon lights. These are designed to give your dog some light while he's out running. It's not for him to see, it's for vehicles to be able to see him if he's out. Maybe running across a road is a possibility. It's also designed to help you keep up with him so that you can see them when they're running. What I like about these lights compared to some of the other lights that are on the market is that they're designed to fit on the collar strap. We've got several other lights that are on the market, and we've got some collars that have lights that are part of the collar. And everything that you've got there is going to be underneath the dog's neck. A lot of times it's going to make it hard to see. It also makes it hard to see if the dog is going away from you. So what's nice about these is that they go up on top of the dog's neck on the collar strap. It makes it easier to see. We've got five different colors. They come in red, blue, orange, green, and white. Two different things they do. You have the solid light or you've got the little button here on the front. To change it, you hold it down. It goes to a flashing light. To cut it off, you hold it down again. It's going to come back solid. Keep holding it. When the light cuts off, you are turned off. I've got one here that's on a strap. They are set up where they can go on a one inch strap or a three-quarter inch strap. You can position it depending on what size dog you have. I like to run two lights on one strap. So, I've got two lights. We're going to position it on the dog's neck. So now it's on your dog's neck and you've got sort of a Y here. So, depending on which way he's moving, we've got lights. You can almost treat it like a boat. You know, right side, left side. But, really, it's just giving you visual no matter which direction he's pointed in. and I think that helps. They are reasonably priced compared to the others. You do not have remote control over them. So you turn them on, they're on. You turn them off, they're off. 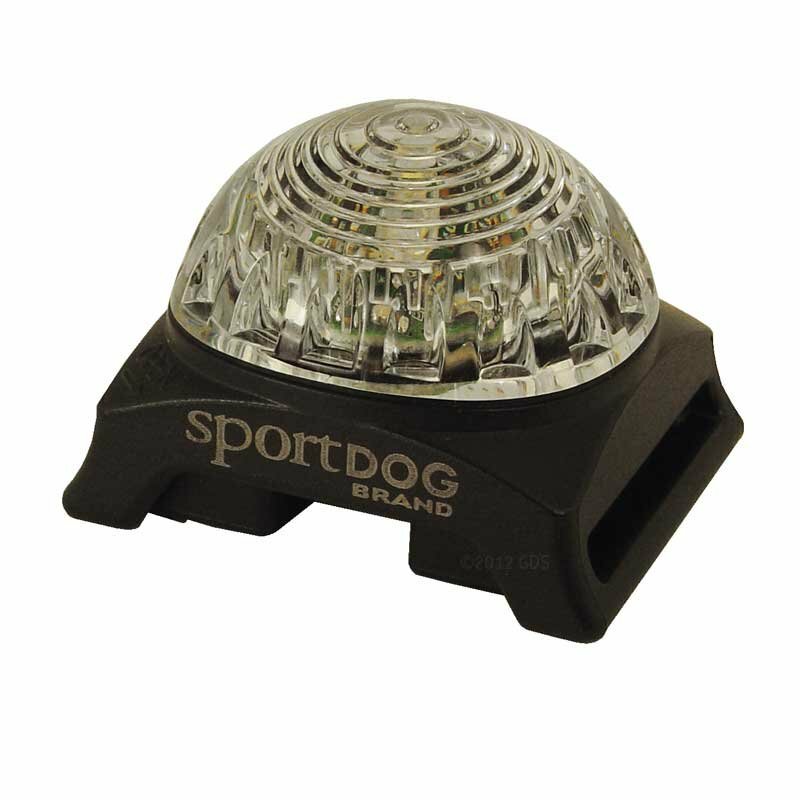 But for guys that are running at night, or if you are running a dog late in the day and you want to put it on as some added security, they work great for that. The other thing, too, is that they're not just limited to dogs and collars. They come with a clip. You can attach this clip to them and then you can hang it on yourself if you need to. Some folks have used them on their kids for Halloween, that type of thing. It's a neat little light. It's got a lot of different uses. We've had really good luck with them. "I have noticed that the green is brighter than the red or orange." I use the beacon on both dogs. It allows me to see them at night when we are out walking or feeding horses. I have noticed that the green is brighter than the red or orange. "Great safety at night in case someone gets out in the road or a dog gets injured, you can find them more rapidly." These are really nifty! They really are waterproof. We have 6 dogs, and when airing at night we can keep track of everybody. We did find each dog needed 2 lights on opposite sides of their collars so you still see the dog no matter the collar's orientation. Depending on what material your collars are made of, they may slide, hence you might what to rivet them in place. In the blink mode, the batteries last an amazingly long time. Only fault is that we found the red, yellow and orange ones are very difficult to turn and off. You twist clockwise to turn on, and vice versa, but the colored domes are VERY tight in these colors, and we've gone through several lights of each color and this seems to be universal, no matter what the source of the light is. Other than helping to keep track of everybody, they are also great safety at night in case someone gets out in the road or a dog gets injured, you can find them more rapidly. "Best item I ever purchased"
Best item I ever purchased... Never have to look for them on their night run. They stick out like a fire truck! Have two dogs...use one blue and one orange. "Was having a hard time seeing my dog when I would let him out at night." Was having a hard time seeing my dog when I would let him out at night. Got one of the beacon lights, and it works great. I can see him really good now. Great light and so far water proof too. Works well. Nice for early morning walks. Going to order another one in the next few days. This is a very bright light, and I especially like the strobe feature, which makes it very easy to see my dog in the woods at night. I bought one last fall for keeping track of my Lab while I set up for ducks in the dark. I hunt mostly public land, and mostly by myself, so I usually have to carry my gear long distances from the truck and make several trips. I let him run around during this time to burn up some energy, and the light really helps me keep tabs on him. I liked the light so much that I just bought two more (one to hang on my truck, and one to put on my gear), so I can go straight from one to the other easily in the dark. Shipping was very fast and products are first rate. Brightest locator beacon I have found!!! Great product. Works great have not had any problems with it yet. A worry about these lights is that if the dog hits a tree wrong, the light might come unscrewed. It is a very simple twist that makes the battery compartment come apart which would cause the light to fall apart. Love this light for when we are out blood trailing deer in the evenings. I combine this light and the brass bell, and I have no problem finding my dog in the thick of it all. I also use it when going for a run in the evening, so that my dog and I are visible to traffic. I bought these to allow a visual for locating my dogs while out running. The lights really help locate them in low light and in the dark. They are bright enough to reflect off the trees, so you can even see the area they're in before you can see the dog's collar. Great product, and its a good solid bracket that fits their collars well. Very satisfied. 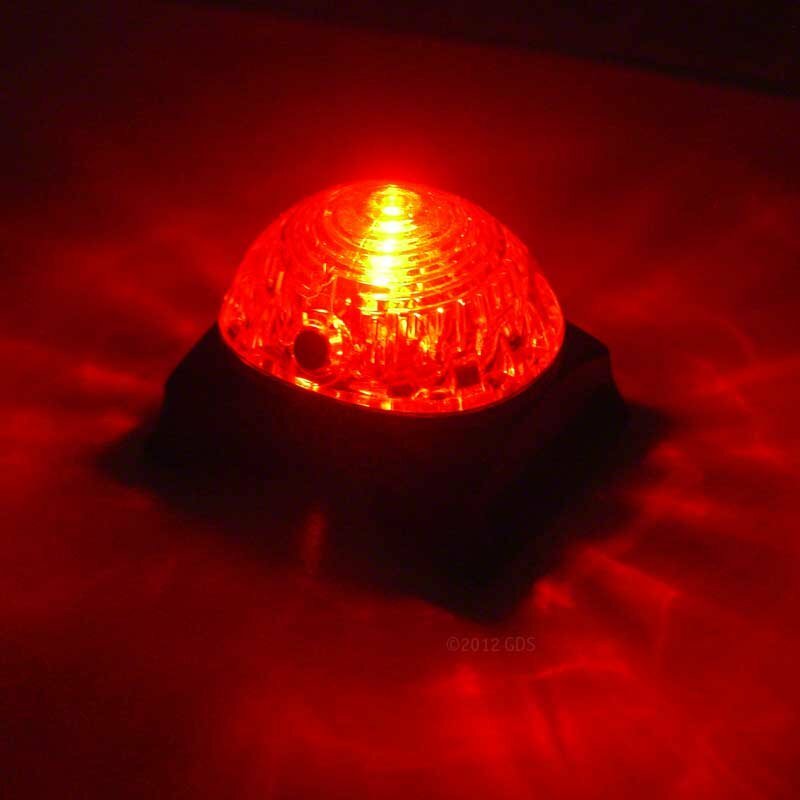 These beacon lights are awesome. 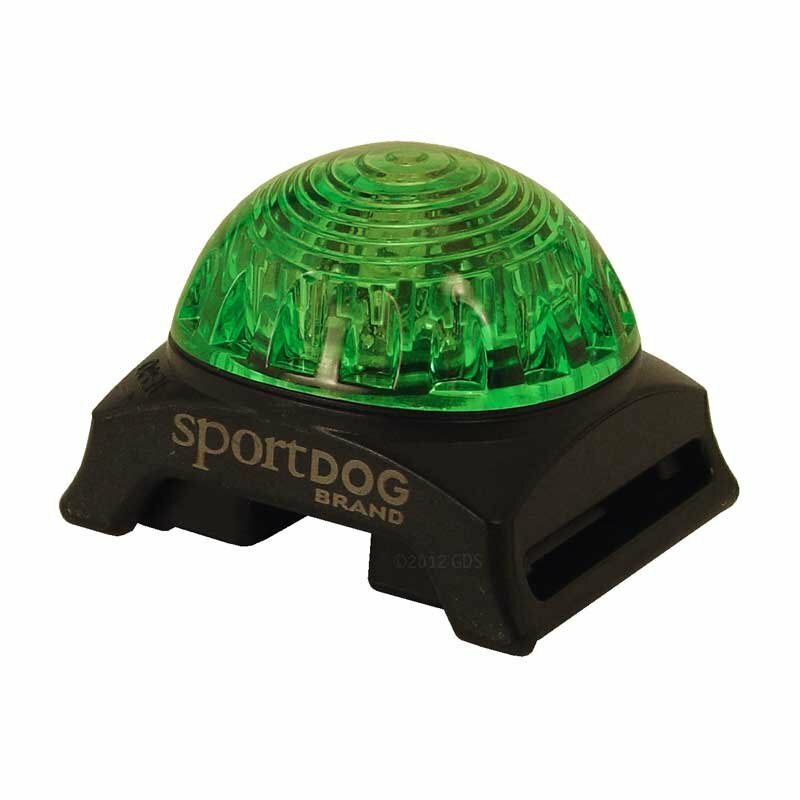 Not only do they allow you to visualize where your hound is at, but the blue and green flashing light also keeps coyotes back from single male dogs hunting by themselves. Steve and everyone at gun dog supply are great. Couldn't ask for better customer service and fast shipping. We definitely like the simplicity - On - Off - Blinking. I don't need 10 different blinking patterns for $10 more like other sites offer. We use it to walk in the evening, so attaching it to the leash is easy, and when she wants to run on her own it is simple to transfer to the collar. If there is one issue it would be that the button is a bit difficult to press. I suspect it is because of the waterproofing rubber seal. Construction quality is excellent. I have purchased a lot of dog collar lights, and these are by far the highest quality and very visible in the dark! Proven to be waterproof and very affordable price. Very happy with my purchase. The beacon works great. You can see what your dog is doing without turning your light on. As usual, everything from GDS is top of the line. I use this when Jasper(GSP) and I go out just before sunrise so I can keep track of him in low light. Plenty bright and has never failed, even after days of swimming. The visibility of the light for tracking the exact location is ideal for early morning , dusk and at night. Our GSP is brown so he is difficult to see. Good safety beacon too. On/off button a bit of challenge. Good product- purchased three. I just love it - using it often, works great, good battery life. Easy to install and operate. I can see my dog in dark far away. For those who do walk late in dark, specially when there is no light on the street and your dog is darker skin - perfect protection - not just YOU see the dog - but the unexpecting driver does too. Tracking at night in woods another good use. I use 2 on 1 collar at 10 minutes to 2 positions. I also purchased this for friends (also few for breeder of my pudelpointer in Czech republic) - everybody loves it. Great present. I can see my dog real easy when hunting at night with these lights on his collar. Great especially for the 0430 walks before work. I used carabiner to attach the light to his lead, and I've had drivers comment that the flashing is even more visible than my reflectorized vest. I added this light to my new Garmin 70. With both lights on his collar he is very visible at night. I love it. The light fits perfectly on the shock collar that we bought before here. The light shines really bright and can be seen at least a half mile away. The two modes work both extremely well, but preferred the constantly on. So far these lights have been great. I recently purchased the Garmin Delta XC e-collar and these have been a great addition. When I am out running/training my dog at dusk or in the dark these make her extremely visible. I purchased two and position them on each side of the e-collar so I can see here from either side. I read the reviews complaining that they are hard to turn on and off but I like the buttons and their difficulty. They are not going to turn on/off by themselves. I wish I had a couple of these things years ago. They really do make your dog visible and safer at night. I gave it 5 stars even with the power button not being the easiest thing to maneuver. Once we figured it out we were better but it would be nice if they come up with an easier way to turn it on and off. I have to use a thumb nail to hold that tiny little button in. That is the only issue I have with it. You won't find a brighter light! We have 1 1/3 acres and he cannot hide at night when this thing is lit! It's great! If it is snowing hard we switch it to strobe light and he is easily visible. It does tend to slide down his shock collar but it hasn't slid off so we are careful. I love it and will probably end up getting a second color. I've been using a blue locator beacon for about a year now and my black lab has tested it thoroughly. Crashing through the the bush, swimming, and wrestling with other dogs. It's still running on the original batteries. I bought the green one for a few reasons. When the light was on the side away from me I wasn't sure where my dog was and at times (ears cover the light sometimes) wasn't sure if he was coming at me or away from me. My dog and I have almost been hit a few times by cars at a four way stop so two light makes us more visible. With two different color lights I know what direction he is going. I recommend this beacon to all my friends who own dogs. Bright white light. Seems to work better hanging from the fob that comes with the light otherwise the fur seems to block it out. Works great. These are great for keeping track of my girls when they are in the woods at night. They respond when I call them, but sometimes I just like to let them run, and these lights let me keep track of where they are. This is an excellent product. I can see my dogs at night when I take them for my morning walk. If I had to hunt at night. This would be visible for a long distance. Love the product. I've already suggested it to a friend, and they love theirs too. Great product. Gives confidence when blood trailing at night. This light is great. It straps onto the collar, so it can't fall off. Had a similar version from another dog catalog that starts with O and ends with vis. It was junk for more money. It just clipped on and was gone in a month. These lights are awesome! They are bright and easy to see in the dark. I take my dog out in the dark, and these are fantastic and easy to see across a 2+ acre field. I'd happily recommend these to anyone wanting to see their dog in the dark. Works well, but only had it a few months. Definitely bright enough. I use 2 on the collar. "This thing is very bright and easy to see." This thing is very bright and easy to see. "Excellent for early morning outings and staying out later." This light is so bright! Excellent for early morning outings and staying out later. "I would have to see it in orange"
We live the country with low ambient light. This is very bright. I bought three of them to go around his collar. We walk at night leash free, and I can see him 50 yards in any direction. If you buy this light, get different colors, that way you can tell which way the dog is moving. 2 blk labs and 1 American Rottie. Family pet. Competes. When I get more money, I will purchase three more. These lights are awesome. It gets so dark here under trees and especially on moonless nights. I will take the advice from the video and purchase two for each dog. Sometimes when the light is on top, the lights will be hidden in their fur or something. These lights are awesome and I can tell my dogs apart in the dark and cars can see them in the street. I prefer to have a light on each side so the light can never be hidden. Well worth the money. "Good design, strong, and easy to use"
Our Teddy Bear doesn't know he's not a hunter. We live on an acre that has a field behind it, and he loves "hunting" squirrels, rabbits, etc. So at night this makes it very easy for us to see exactly where he's "wondered" off to. It's great! Great light. Kids do have a difficult time of turning it on and off. Not sure if that is a pro or con. If it were easier, the Lab would probably be turning it on and off. I don't think I would want it made differently. 5 stars. "Works well and I have a black lab that cannot be seen in the dark. I will order more." Works well and I have a black lab that cannot be seen in the dark. I will order more. "Great product and fast shipping from GDS." Bought the blue and green ones. They are very bright! Perfect at night. I could turn it on and off with my fingernail. Not sure what others are complaining about having to use a sharp instrument. Great product and fast shipping from GDS. "this helps me keep her in sight when it's dark"
I run trail with my pup, and this helps me keep her in sight when it's dark. Good product. Easy to use. Thanks! "Makes it easier to tell where dogs are while hunting"
I have one for all my dogs. Makes it easier to tell where dogs are while hunting. 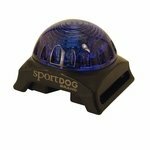 The locator beacon is a great product for helping to track your dog at night or low light conditions. I would highly recommend this product to anyone training dogs at night, or if you want to keep track of your pet when it goes out at night. My only complaint with the product is that it is a little hard to turn off. The small on/off button is not easy to use, especially in wet conditions. Overall a great product! 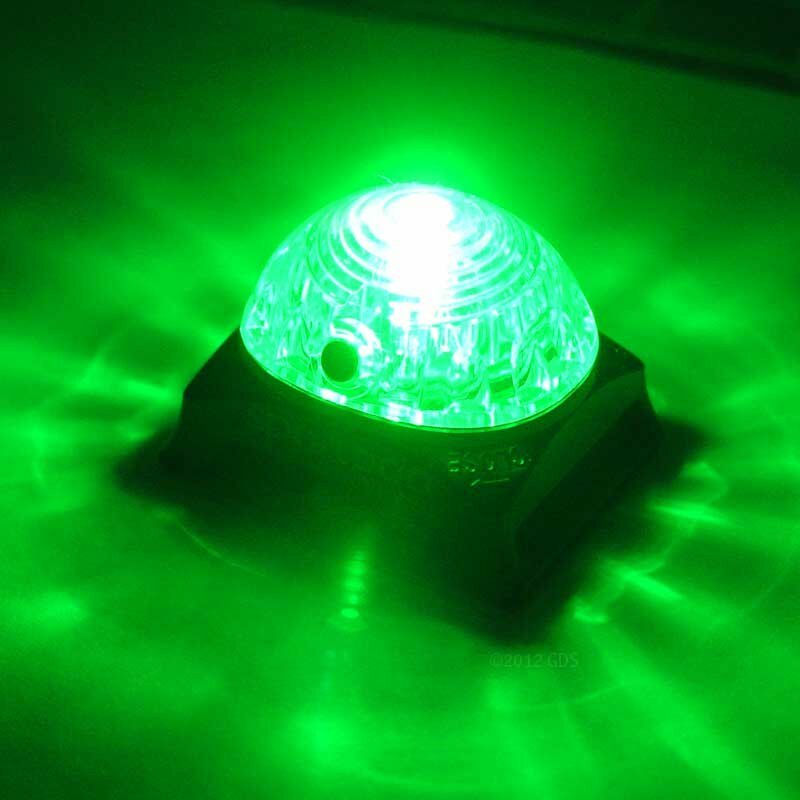 I would recommend the green, red, blue or white lights to anyone that is buying one of these products. The amber/yellow light is not as bright as the other models. The only reason I did not give it 5 stars is because the light goes out after a few minutes when it is cold outside. I ordered 4 lights. The 3 that work are awesome, but the 4th light never worked from the time I took it out of the package. I tried new batteries, and still had no luck with it. A new one is supposed to be on its way to me now, so hopefully it works! "I have an older one I like better"
I have an older one I like better. The new one needs something pointed to operate. The old one you just turn to operate. "No losing site of your dog in the dark when this light is on." Only problem I have with this product is the way it has to be turned off and on, or changed from flashing to solid. Not to easy. Other than that it does it's job as intended. No losing site of your dog in the dark when this light is on. Great for my GSP as I let him out of his kennel to run the yard (which is very large) before work, and one look out the window and there is no wondering where he went. I bought three of these and they work well. The only negative is that two of the three are sometimes hard to turn off. Excellent visibility. On/off switch is a bit difficult to work. Other than that it's great! Light is very bright, and the strobe feature is nice. The on/off switch seems difficult to find and push for the off/on and strobe modes. We are running at night during the summer to beat the heat. We run around some public roads. Not only do I feel my dogs are safer now, but I can easily tell now when my dogs cross first lol. One time dogs crossed a bean field at just over a mile according to the Garmin. Could still see these lights pretty well! I purchased two lights, one white and one blue. The white light is very bright, and when it's placed on the back of the collar can be blinding to the person walking the pet. I flipped it under so its under the chin of the my dog. It doesn't seem to bother my dog, and it does light up what is in front of him since I do let him off leash at night. I use the blue one with the anywhere clip and clip it to my belt loop or jacket so that I am more visible as well. Very bright! I would have liked it better if it could fit on every collar, and if it could be rechargeable with USB connection. Biggest issue is the on/off button. Very difficult to get to, and to have the light blink, I need to first press the button for 2 seconds, release and then press again. Given how hard it is for fat fingers to get to the tiny button, it is very frustrating. As far as light goes, the green is the highest visibility. It is very good. The opening to slide the collar through could be opened up a little more. Had to modify with a file to get it to slide through. "The lights are highly visible and very helpful in showing us (and others) where the dogs are when working"
We have working border collies (and a flock of about 200 sheep). The lights are highly visible and very helpful in showing us (and others) where the dogs are when working at night/dusk/dawn. 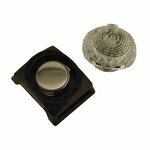 However, the on/off button is very difficult to use, and we find ourselves needing to remove the collar to adjust the light. This is exactly the type of product we need, but it would be even better if the button is revised in a future model. Good product, but frustrating ON/Off button. Product is good, but I can't use it because it interferes with his boundary collar. "This light is extremely bright, and I can keep my eye on him at all times"
My dog likes to roam in the woods at night smelling tracks. This light is extremely bright, and I can keep my eye on him at all times. The only downside is the clip that attaches to the bottom. It's not very secure, and he lost it on day one. I had it turned off "too bad". If it was on, I'm sure I would have found it. If the clip was better, I would have given it five stars. 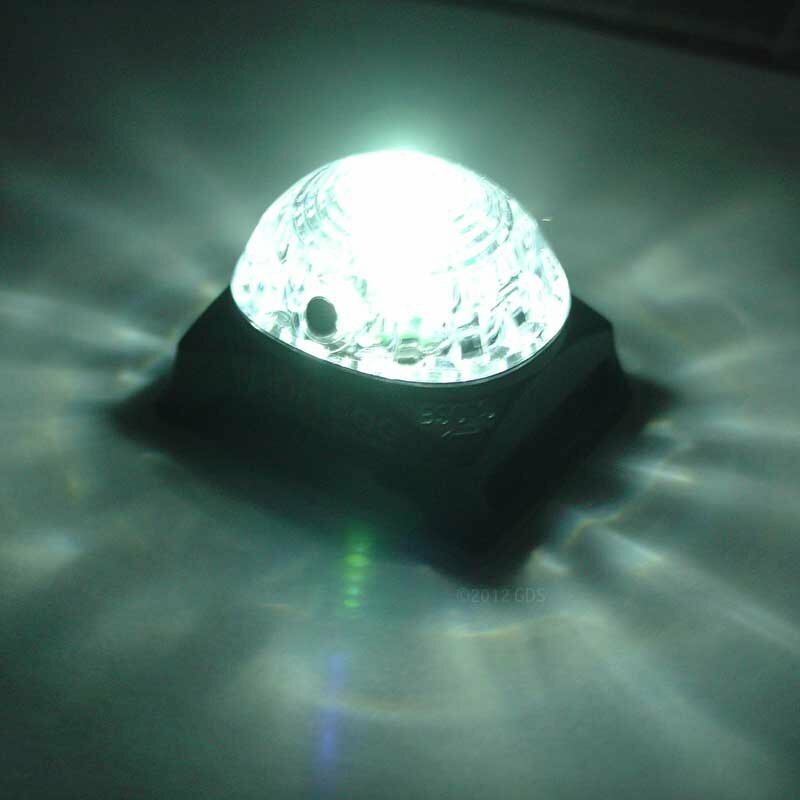 I am very happy with the brightness of the light, but I find it very difficult to turn on and off. "Light is great, very bright, waterproof, durable." Light is great, very bright, waterproof, durable. Does not fit on large (thick) dog collar, so need to use the included strap. Still okay, but would be better if it fit on the collar. Switch is a bit difficult to use (push button very small). Need to use an object to push it and hold it in. However, this keeps it from being turned off accidentally. Would buy again. Good value for the price, and the best I've seen. Hard to put on collar... Will use zip ties. Irish setter. Hunts. Family pet. The old versions, as far as mounting, were better. Could not slide onto collar as the width of the opening is too small. Would only work with very thin collars. Have to hang on collar, so most likely will be lost at some point. Older versions could easily fit your collars we buy. Disappointed in that the light is nice and bright, but the on-off button is very hard to use. Beacon does not fit on a thick leather collar, so you have to use a thin nylon or rubber collar. The on button guarded from being accidentally shut off which is good, but almost too good. You have to use a pointy implement to activate, then go through cycles to turn the device off, cumbersome. Lights up well though, we'll see how well it lasts. Light itself is wonderful. But on/off button is a nightmare to operate, and I don't have arthritic hands! Light is large and bright. 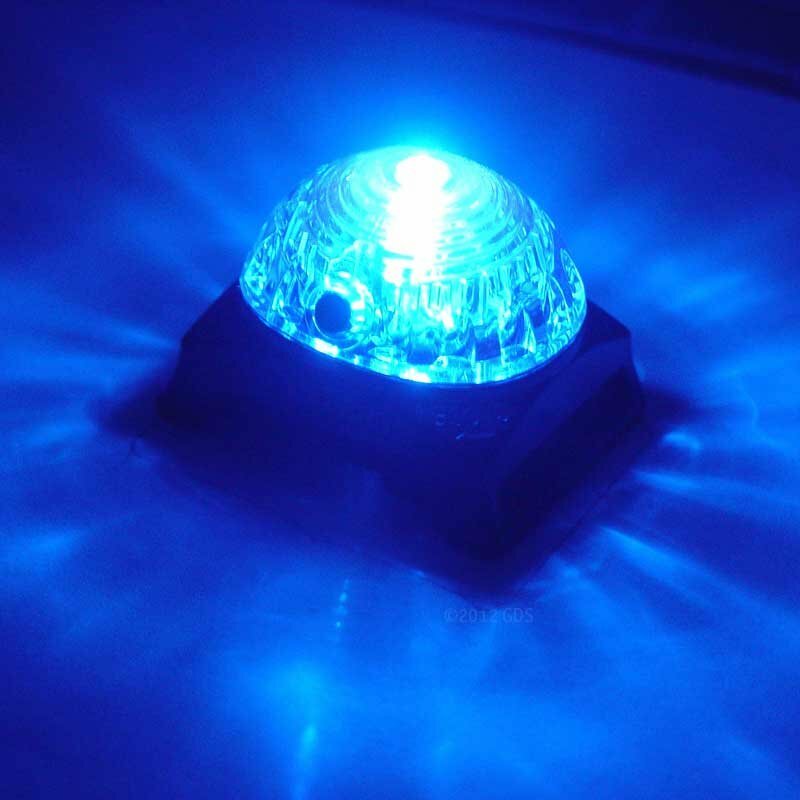 A much smaller LED would have been sufficient for locating the dogs. A smaller light would take less collar space while extending battery life. "I much prefer the Tracker flash-light, as it's a more simplistic design." It works, but the button to operate its various functions is small & a pain to use. Especially when on the dog. 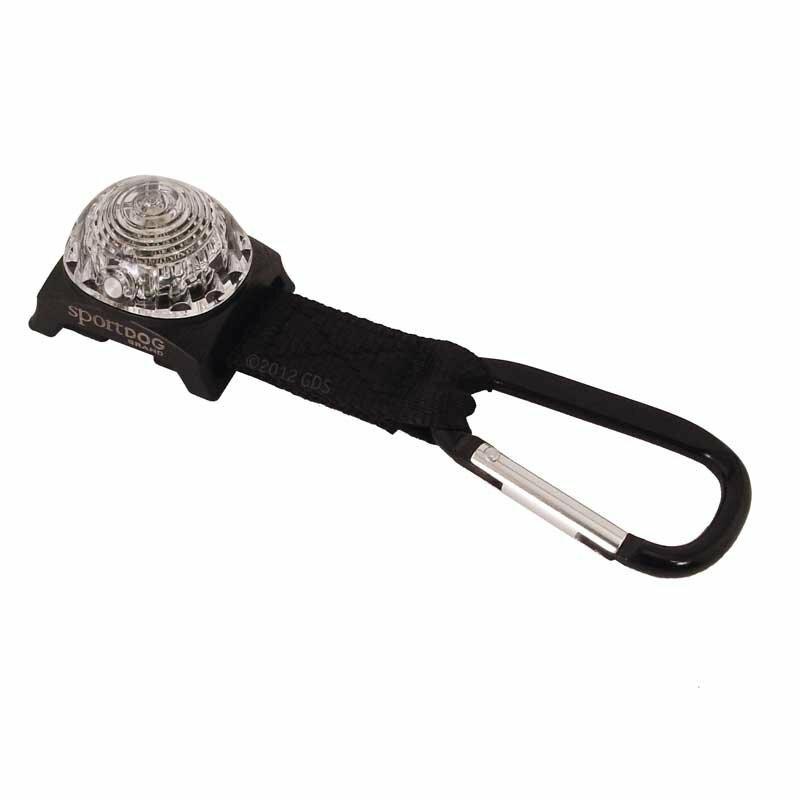 I much prefer the Tracker flash-light, as it's a more simplistic design, quick and easy to use (even with gloves on). The switch to turn it on/off is way too small.... Otherwise it is good light. "Very difficult to turn on/off"
Very difficult to turn on/off. 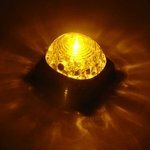 I think GunDogSupply.com should have told customers that this light is not compatible with the K-9 Komfort TufFlex Collar. The slots in this light are too narrow for the thickness of the K-9 Komfort TufFlex Collar. 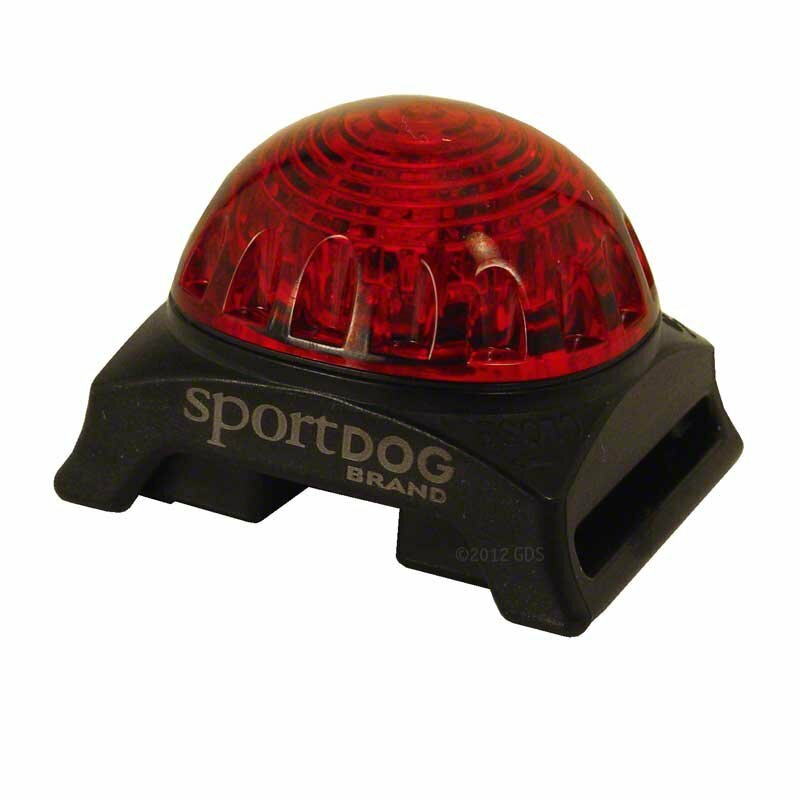 The reason I gave this light a bad review is because 1. the light didn't work out of the box (-1) and 2. when I called customer support at SportDOG, they really couldn't care less (-2). That is why it got a bad rating. On/off switch is impossible to use. Fortunately, the Ruffwear beacon Steve sells on the site is a great product, and was replaced by him after I wrote concerning my disappointment with this product. Slides onto E-collar straps only. The included carabiner clip is required to attach to standard dog collars. The SportDOG Locator Beacon Dog Tracking Light comes with the 3/4" collar strap adapter pre-installed. If you want to use it on a 1" collar strap, just remove the adapter by popping it out of the base.